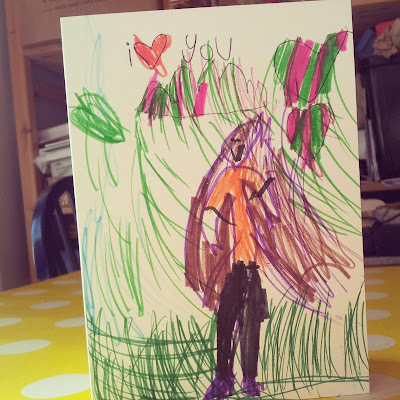 Sunday was Valentine's Day, which started with M rolling out of bed and deciding she had to make another card for me. We had plans to go out, but I didn't mind too much as it allowed me to check the weather forecast while a small person crafted. Last minute Valentine's Card for Mummy. Once M was satisfied, cards were exchanged, chocolates were sampled and we were ready to face the day. Valentine's Day for us involved a trip to Stratford to meet up with friends from Devon. The day was bright, but very cold and we'd decided to visit the MAD Museum. 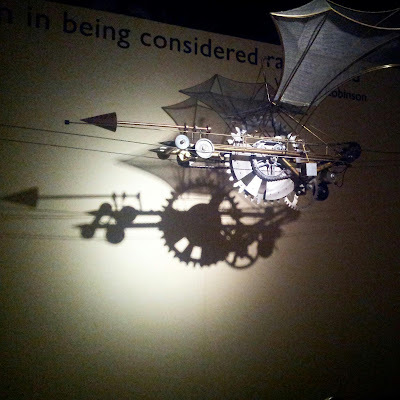 MAD is of course an acronym for Mechanical Art and Design, which meant lots of automata, very complex marble runs and interactive art installations. Finding the museum took a short while as it is tucked away above another shop, meaning we had to look up. We're not regular visitors to Stratford, indeed the last time I wandered around the town centre was before M was born, which meant we were taking in a new place with many, many fascinating shops. Very distracting shops! The MAD museum is accessed via very steep stairs, surrounded by a big marble run installation of rolling golf balls inside tubing around the stairwell. There was a lift to take the balls up to the top again, keeping the system going and providing a fascinating entrance way. We stood there, blocking the stairs, for at least five minutes as M watched, working out how the arrangement was put together. Finally, we made it up the stairs, paid, were given a brief safety talk (press buttons, but do not put your fingers inside the machines) and we were inside. 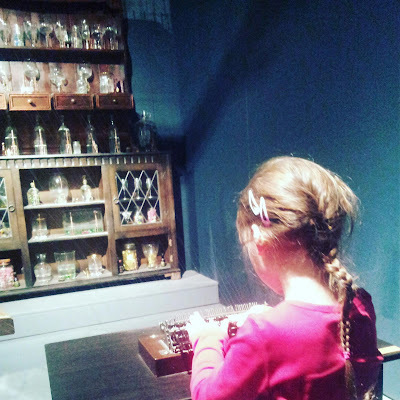 M takes a turn on a musical typewriter, connected to glasses via piano wires. Oh my gosh, there were so many marble runs, constructed out of all manner of things. Some out of wire, others from pipes, some from wood, and even household objects such as kitchen implements. Balls were rolled, lifted, bounced and flung, in never ending cycles, triggered by the press of a button. All three of us were hooked. The museum were holding a competition to design a MAD machine of your own. They will apparently pick one and build it, so M was keen to draw something to submit. After a few inspirational drawings, M came up with a 'Ball Looper', which had a corkscrew lift and a fan blowing the balls into a funnel, after which they travelled down a tube and back to the bottom of the lift. No pics I'm afraid, as I forgot! 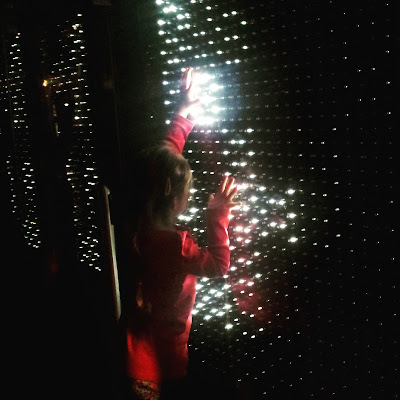 M plays with an interactive art installation. We were in there well over an hour, which for a tiny museum is not too bad at all. Once we emerged, we ran the gauntlet of shops (I think we need to come back for a proper wander when it is a little warmer) before walking to the rec ground and play equipment. It was bitterly cold, but small people had energy to burn off. There we stayed until the fading light and rapidly dropping temperature, made us hustle back into town for a hot drink at our friends' hotel before going home. We looked at the artwork in the lounge, studied a collage of jesters with Jack'O'Lanterns entertaining a Tudor banquet, which led to me retelling the tale of Stingy Jack. This was a story that has several versions, but has its roots in folklore, giving the origins of the Hallowe'en tradition of making Jack'O'Lanterns. My tale started with the fact that while the artist may have shown the lantern made from a pumpkin, traditionally the lanterns were made from turnips or swedes. Pumpkins only came later with the discovery of the New World. I've linked to a version of the Legend of Stingy Jack from Wikipedia, but be aware there are several different versions of the story. The version I told was similar to the one we heard at Mary Arden's Farm last Hallowe'en, but I simplified it to take into account two very tired small people. Long, long ago, there was a miserable, miserly, drunk called Stingy Jack. Jack was called Stingy, because he never, ever, EVER, paid for anything. One night, Jack was drinking with the Devil in the local tavern. It was Jack's turn to get the drinks in, but Stingy Jack, never, ever, EVER pays for anything, so Jack said to the Devil. "I've had an idea. Why don't you turn yourself into a gold coin and I'll use you to pay for the drinks." Now, you can tell how long the Devil had been in the tavern because he thought this was a fine idea and agreed. The Devil turned himself into a gold coin. Jack quickly scooped him up and put him in his pocket, but being Stingy Jack (who never, ever, EVER, pays for anything), he snuck out the back door of the tavern. Now, it happens that in Jack's pocket was a silver penny which bears the mark of the cross on one side. The Devil's powers are cancelled out by the sign of the cross, which meant he was helpless and couldn't change back. So it was that Stingy Jack carried the Devil in his pocket for a whole month until one day he was walking along in a thunderstorm and took shelter under an apple tree. Suddenly lightening struck the tree Jack was standing under, and a startled Jack fell to the ground. Unfortunately the coins all fell from his pocket. The Devil was free. He changed back from being a coin and a very ANGRY Devil stood over the cowering Jack. But this was Stingy Jack, who never, ever, EVER pays for anything, which requires a degree of cunning... And to be fair to the Devil, he had spent a whole month in a pocket so may not have been thinking straight. "Please..." begged Jack, "I have a last request, for I will surely die. May I have a taste of the apple from up there?" And Jack pointed up into the tree. The Devil agreed and climbed the tree to pick the apple. Quickly, Jack leapt to his feet and used a knife to carve crosses all around the trunk of the apple tree. The Devil could not pass the crosses, which meant he could not climb down from the tree. Stingy Jack gathered up his dropped coins and hurried on his way. "I'll be back, in a year. I promise!" he said. The Devil was very angry, but there was nothing he could do but watch as Jack walked away. A year later, Jack came back and looked up at the Devil. "If I let you come down," he shouted "You have to promise that you will not take my soul, ever." The Devil, who was by now very fed up, scowled down at Jack. He seemed to consider for a moment, then replied, "Alright. I PROMISE I will not take your soul, EVER." Jack used his knife to scratch out the crosses and the Devil scrambled down the tree. Jack tipped his hat at the Devil, smirked and walked away. There was nothing the Devil could do, he had promised. The years passed and as he had lived, Jack died all alone. Jack found himself at the gates of Heaven and he asked to be let in. The angel guarding the gates consulted his book, looked at Stingy Jack and shook his head. "No." he said and pointed to steps leading down. "You belong in the other place." Jack made his way down the steps and found himself at the gates of Hell. Even with the gates firmly closed, he could feel the heat reaching out to him. Leaning on the gates was the Devil. When the Devil saw Jack, he smiled. "Please may I come in?" asked Jack. You see, he could not let Jack into Hell, because the Devil had promised to not take his soul, ever. The Devil reached into his pocket and gave Jack an ember from the fires of Hell, to remind him of where he belonged and then sent him on his way. The ember was too hot for Jack to hold and so Jack found a turnip, he carved it out and dropped the ember inside, creating a lantern. And to this day, Jack wanders the lands, looking for somewhere to go. He is not welcome in either Heaven or Hell and he is all alone. Over time Jack became known as Jack Of The Lantern, or Jack'O'Lantern, and at Hallowe'en we carve lanterns out of turnips to remind us of the folly of those who would do deals with the Devil.